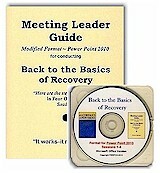 This 128 page book is a companion for the Back to the Basics of Recovery Meeting Leader Guide, which is a 2015 version of the 1946 Back to Basics A.A. Beginners Meetings. The book has been specifically rewritten for use in treatment centers, aftercare facilities, half-way houses, recovery homes, correctional facilities, and Twelve-Step meetings. The book has been modified to apply to all addictive and compulsive behaviors and all Big Book passages are gender neutral. 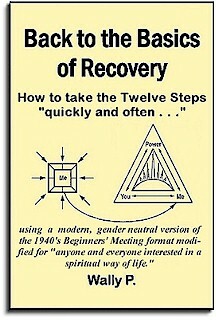 The book contains all the materials necessary to take the Twelve Steps quickly and often, and it is a program for anyone or everyone interested in a (new) way of life. Price listed is for Media Mail within the United States only! 2015 version of the 1946 Back to Basics A.A. Beginners Meetings, specifically rewritten for use in treatment centers, aftercare facilities, half-way houses, recovery homes, correctional facilities, and Twelve-Step meetings. PowerPoint slides are available to enhance the recovery experience. This 150 page, three-ring binder contains all the materials necessary to take people through the Twelve Steps in four, forty-five minute sessions. This Meeting Leader Guide has been modified to apply to all addictions / compulsive behaviors. This is truly a program for anyone or everyone interested in a (new) way of life. Price listed is for Media Mail within United States only! For Recovery Homes, Half-Way Houses, Treatment Centers, Correctional Facilities and 12-Step Meetings/Groups. This PowerPoint 2010 CD is a replacement for the 35mm Slides that became obsolete years ago. It contains all the "Big Book" passages used to take attendees through the Twelve Steps plus photographs relevant to the Beginners' Meetings. All that is needed to convert your Beginners Meeting to PowerPoint is a laptop computer and a multimedia projector. Session 1: Steps 1, 2 and 3. Session 2: Steps 4 and 5. Session 3: Steps 6, 7, 8 and 9. Session 4: Steps 10, 11 and 12. Handouts: Eighteen pages of materials for the attendees, including a simplified version of the Fourth Step inventory. This package also includes the PowerPoint 2010 presentation CD, which is a replacement for the 35mm Slides that became obsolete years ago. All that is needed to convert your Beginners Meeting to PowerPoint is a laptop computer and a multimedia projector. Price listed below is for Media Mail within the United States only! Listen as Wally and friends take a room full of people through the Twelve Steps. 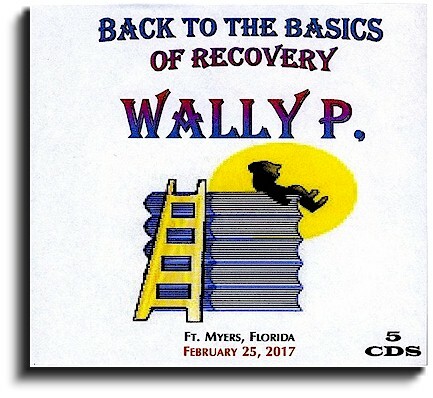 These CD's were recorded live at a Back to the Basics of Recovery Seminar in Boca Raton, Florida. Price listed is for Priority Mail within the United States only! Just paste the four peel and stick labels in the back of a miniature fourth edition "Big Book", highlight the paragraphs and you are now ready to guide anyone through the recovery process. Four pages per set - five sets per package. All DVDs, Stand-Alone CDs, Thumb (Flash) Drives, and other Digital Media have been moved to the new "DVD's, CD's, and Other Digital Media" Bookstore!